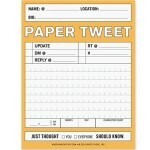 Get on the social-networking bandwagon with our cutting edge Paper Tweet Notepad! 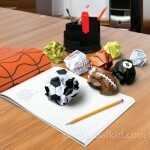 The wireless miracle of pen and paper will have you expressing your mundane, or even pressing, thoughts anytime, anywhere! Master the art of brevity in 140 characters or less with our Paper Tweet Notepad.